Occasionally you may want to do drivers backup so that you don’t have to search for it in case you lost the original driver CD or don’t have internet access to download a new one. That is how this simple software utility comes useful with. Named as Double Driver, it helps users to do drivers backup and restore with simple GUI for more effective work. For the start, just click on ‘scan’ button to execute the scanning of all the device drivers available in your PC system. Once completed, you will notice a long list of device drivers being listed down together with its version number, date, setup section, hardware ID, provider name and so on. By default, all non-Microsoft drivers will be selected or users can choose to backup only specific drivers depending on own preference. After selecting the specific drivers, just click on ‘Backup’ button and it will prompt you the destination folder that you can keep all the drivers into. 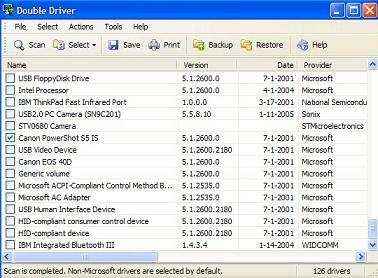 Double Driver consumes as little as 2MB and it is suitable to used in Windows Operating Systems. If you think this is useful, just download one here for immediate use.